Produced by a dedicated team based in Colac, the Colac Herald arrives each Monday, Wednesday and Friday with the district’s most up-to-date and in-depth news and sports reports and advertising that’s a proven winner. A newspaper created for Colac and district by people who make Colac and district their home, the Colac Herald continues a tradition dating back over 150 years to the launch of the Colac Observer in 1866. The Colac Herald rolled off the presses in 1868 and absorbed the Observer in 1874. 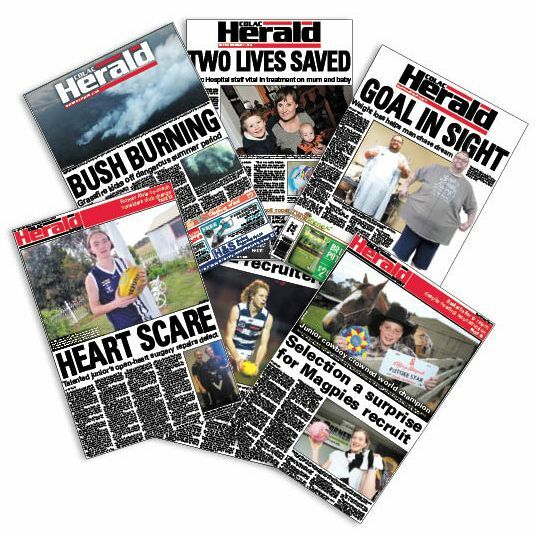 Other newspapers have come and gone during the Colac Herald’s history but the Herald has stood the test of time and proudly continues to serve Colac and district as one of the few truly independent media outlets remaining in Australia. The Colac Herald was purchased by Greenstone Media Pty Ltd in late March 2017. It remains a locally owned newspaper and will continue to be much more than simply words and pictures. The Herald has won a string of international, national and state awards, including the Victorian Country Press Association’s Overall Newspaper Excellence Award. The Herald’s 2018 wins at the VCPA awards included the awards for Best Photographic Study and Best News Story, as well as five high commendations and three commendations in the advertising, journalism and photography categories. The journalism, photography and advertising awards which fill the Herald’s bulging trophy cabinet are proof that the Colac Herald is a shining light in regional Victoria’s media industry and guarantees our readers and advertisers get value for their money. With news stories that focus on issues that matter to Colac and district, sports reports that embrace and acknowledge the achievements of our sportsmen and women, advertising tailored to the market, the region’s best real estate guide and a guaranteed readership, it’s obvious why the Colac Herald is Colac and district’s number one media outlet. You’ll find the Colac Herald at 37-41 Bromfield Street, Colac, can call us on 03-523 15322 or email us via our Contact Us page. Click here to find out where to buy the Colac Herald.